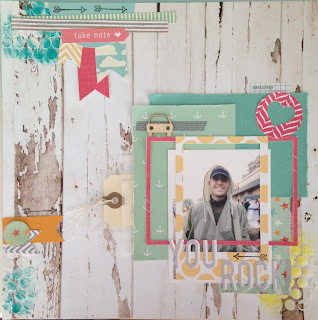 Little Peace of My Heart: Layout: You Rock! Here is my latest completed layout. I really wanted to scrap this day but unfortunately, this was the only picture I took and it was HORRIBLE! To make the best of it, I used brightly colored paper and some die cut frames to enhance the picture as best I could. The video below will show you how the layout went together and the story behind the photo. Thanks for stopping by!